The men's T-shirt, is the essential item par excellence. 100% cotton and with recycled sailcloth inserts, the 727 Sailbags t-shirt is stylish and timeless. Short sleeves or long sleeves, take your choice from the men's navy blue t-shirt or the men's white t-shirt. A varied choice with different colours. 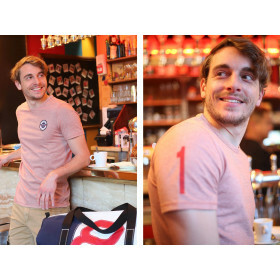 A classic or a trendy item, go for your men's sailor t-shirt!